Enjoy healthy burgers two ways this week! 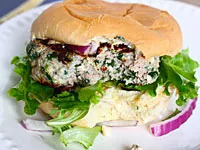 First up, sink your teeth into a juicy, lean turkey burger stuffed with spinach and feta cheese. Then, try a veggie burger topped with homemade mushroom gravy and cheddar cheese. Both will please even the pickiest eaters in the house and make great leftovers. The pulled pork requires a Crock-Pot but couldn't be easier to make—and is definitely worth the wait. Enjoy! These simple burgers are healthy and delicious. 1. Mix together all ingredients with your hands and form 4 medium-size patties. Cook patties in greased skillet for about 6 minutes per side, or until meat is completely cooked. 2. Serve on toasted buns with extra feta, hot sauce, sliced onion, lettuce, and ketchup and mustard. 1. Heat butter in a large skillet over medium-high heat. Add shallot and cook until tender, then add mushrooms and continue cooking until soft and juicy. Sprinkle with salt, pepper, dried thyme, and flour, and toss to coat well. 2. Cook for another 4 minutes, stirring constantly. Then, slowly pour in stock and whisk over medium heat until thickened (about 3 minutes). Add cream and additional salt to taste. 3. Cook veggie burgers on the grill or on the stove. Top burgers with mushroom gravy and cheese. A favorite in my house, this pulled pork is a breeze to make and as tasty as it gets. 1. Rub salt, ground mustard, and cayenne all over pork shoulder, then brown the shoulder on all sides in a heavy pan on medium-high heat. This should take about 10 minutes. 2. Remove browned shoulder from pan and place in Crock-Pot along with chopped onion and sauces. Turn Crock-Pot on high and cook for 6 to 8 hours. You’ll know the pork is ready when it falls apart when stabbed with a fork. 3. 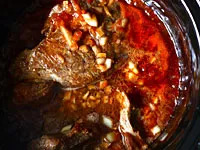 Remove pork from Crock-Pot and shred with a fork, then place back in sauce and serve.